I am not one to stereotype people and in my blog posts on the fluoridation controversy I have so far steered clear of the more whacky arguments that come up. After all, some of my friends oppose fluoridation and I would not want to attribute these whacky reasons to them. (Mind you – I have some suspicions). But it seems that even in little old New Zealand some of the leaders and foremost spokespersons for the anti-fluoridation activists are presenting these whacky ideas. So we can’t really avoid them. Hamilton oncologist Dr Anna Goodwin appeared for the anti-fluoridationists at the recent hearings held by the Hamilton City Council. She spoke for them at a recent Auckland meeting as one of the 3 “expert” dentists and doctors (although she claims only to have had her road to Damascus moment in the last few months). These people just love titles, don’t they. She is promoting the conspiracy theory that fluoride is purposely added to public water supplies to ensure a docile population! (And perhaps giving us a wee peak at her political or ideological stance). But here’s an example of an extreme form of these anti-fluoridation conspiracy theories in the US – an interview by conspiracy theorist Alex Jones. He discusses addition of lithium and fluoride to water supplies. The dangers of immunizations are also discussed along with how these poisons are used by design to chemically lobotomize people. via Neurosurgeon Uncovers Fluoride & Lithium Conspiracies Part 2 of 4 – YouTube. And there is more rubbish where that came from. This sort of thing annoys me – not just because it excludes a large proportion of the population from social discussion. But also because it demonstrates a cultural blindness. Some people are so blinkered they won’t even acknowledge that elephant in the room. But really he is contemplating unity of action of only religious people. Again he has ignored that large elephant in the room. Interfaith action is not going to include the non-believers. But there is plenty of “humility, awe, justice and peace” at the centre of many non-religious traditions too. Especially today. Why exclude them? All of us are capable of noble values – irrespective of religious belief. Although I sometimes wonder at the capability of some religious leaders and commentators who seem to have a very blind spot reserved for the non-religious. *This plot shows the change in religious diversity according the New Zealand census results since 1991. Last census Christians amount to 49.5% of the population (after taking “double dipping into account). The Hindu religion has the next largest numbers for a religion – but amounted to less than 2%. Why concentrate on unity with the very small religions while refusing to include the non-religious (33%)? Two well-known personalities in the world of climate change science are in Auckland this month. 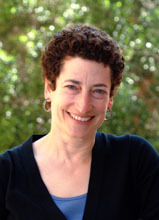 Naomi Oreskes, Co-author of Merchants of Doubt: How a Handful of Scientists Obscured the Truth on Issues from Tobacco Smoke to Global Warming. And James Hansen Author of Storms of My Grandchildren: The Truth About the Coming Climate Catastrophe and Our Last Chance to Save Humanity . Oreskes will give the Michael King Memorial Lecture at the 2011 Auckland Readers and Writers Festival on May 14. “Doubt is our product,” ran the infamous memo written by one tobacco industry executive in 1969, “since it is the best means of competing with the ‘body of fact’ that exists in the minds of the general public.” There’s no denying “doubt” is crucial to science and drives it forward, but it also makes science, and scientists, vulnerable to misrepresentation. Naomi Oreskes co-wrote Merchants of Doubt with Erik Conway: an important and absorbing history of a group of high-level US scientists and advisers with deep connections in politics and industry. The same individuals surface repeatedly: claiming that the science of global warming is “not settled”, denying the truth of studies linking smoking to lung cancer, coal smoke to acid rain, and CFCs to the ozone hole. We are honoured to have Naomi Oreskes give the Michael King Memorial Lecture, with an introduction by the Science Editor of the New York Times Barbara Strauch. Time: 01:00 p.m. – 02:00 p.m.
via 28 NAOMI ORESKES AND THE MERCHANTS OF DOUBT – Auckland Writers & Readers Festival. 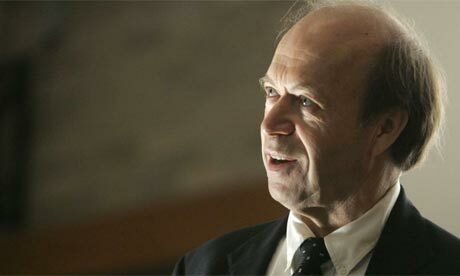 James Hansen is touring New Zealand this month, giving a public lecture entitled “Climate Change: a scientific, moral and legal issue” in Auckland, Palmerston North, Wellington, Dunedin, Gore and Christchurch. Coal and lignite will be a major focus of his visit, and he’ll be participating in a symposium on “the future of coal” in Wellington on May 17th. Hansen’s tour is being sponsored by a number of groups, including 350.org, Greenpeace, Organic Systems NZ, Oxfam, The Pure Advantage, the Institute of Policy Studies, and a number of interested academics and individuals. This looks like a fascinating lecture. 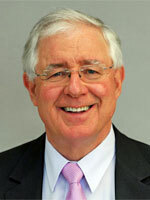 Professor Richard Faull FRSNZ, Director of the Centre for Brain Research at The University of Auckland, is presenting the Royal Society of NZ Distinguished Speaker lecture series this month. He is a leading expert on neurodegenerative diseases of the human brain. His research provided the first evidence the diseased human brain can repair itself by the generation of new brain cells and led to new insights into the treatment of brain disease. Hopefully things will go well. He will get the necessary repairs, a well-deserved rest and return renewed to his blogging. I try to read his blog, Pharyngula, daily and I know others do as well. I enjoy his daily dose of humour and common sense. PZ is an excellent communicator and we need more people like PZ to defend science and reason. I am personally amazed at the time and effort he puts into this communication. During the last year he has been on sabbatical leave. While he has been writing a book I know this is disrupted by the traveling and large number of meetings he has been speaking at. In the USA and internationally. I met him last March at the World Atheist Convention in Melbourne and was impressed at how eager he was to meet everyone. This willingness to make himself so available has resulted in a hectic round of speaking engagements and public appearances in this last year. While this has been great for the communication of science and reason it must have had a toll on his health. So, hopefully, PZ will take this health alarm as a warning. Recognise that he needs to consider his own needs more and turn down some of the requests for public appearances. Hopefully Myers will return to blogging soon. And I hope to see his book published. I will be satisfied with that and I am sure most of his regular readers will be too. Which brings me to another of my concerns. Dawkins is also someone who gives his time extremely readily. His life must also be very hectic. 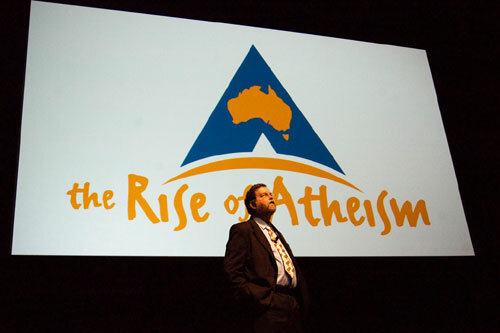 I was aware that at the time of the World Atheist convention he was traveling around New Zealand and Australia and speaking to sell out audiences. It amazed me that he spoke in Auckland on the Saturday night and in Melbourne on the Sunday afternoon. Those who went along to hear him certainly appreciate his willingness to make himself so available. But perhaps he should also be taking a lesson from PZs current health problems. 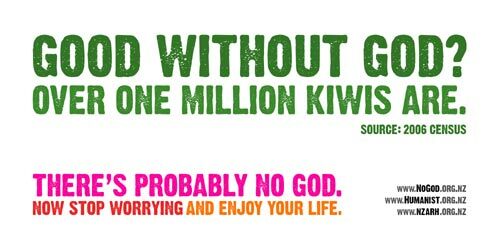 The NZ Atheist Bus Campaign will unveil billboards with friendly atheist slogans in Auckland, Wellington, and Christchurch this week. 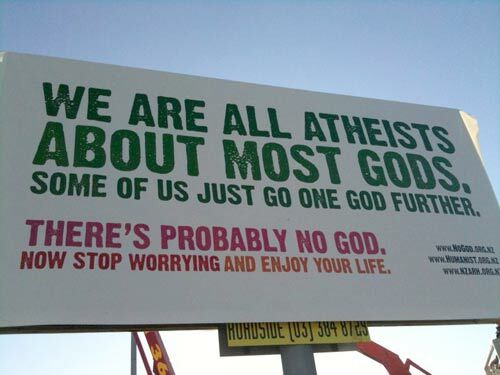 The campaign has chosen the three winning phrases from more than 900 public submissions of billboard slogans. “We’re excited about this opportunity to promote these thoughtful slogans and hope they’ll get people to stop and think.” said Simon Fisher, spokesperson for the Campaign. borrowed from the successful UK bus campaign. With the launch of the billboard campaign, the organisation is also reopening its call for donations from people who want to see the billboards moved to other cities. “While the bus campaign would have been limited to main centres, the great thing about these canvases is that once printed they can be toured to other centres” said Mr Fisher. “If a community wants to put one of our billboards up in their area they can contact us, arrange a location, and we’ll be delighted to lend them the canvas”. Despite similar campaigns being run internationally, the organisation’s plans to place ads on buses in New Zealand hit a brick wall earlier this year when NZ Bus accepted and then rejected the billboards, leading to the Campaign’s decision to take the issue to a tribunal. “The Campaign is still committed to the discrimination case against NZ Bus through the Office of Human Rights Proceedings. “We have kept funds in reserve for a bus advertising campaign if this is successful.” said Mr Fisher. 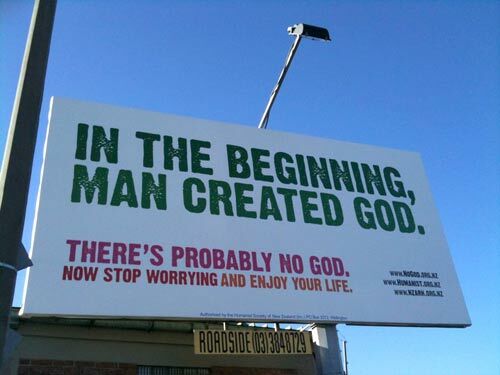 Interested Kiwis can see the billboards in Auckland, Wellington and Christchurch from Friday this week. Thanks to Toby Ricketts for the photos of two billboards just installed in Christchurch. I reported recently that Richard Dawkins will speak in Auckland next March. Looks like there has been an overwhelming demand for tickets. To accommodate everyone the organisers have now arranged a live screening of Richard Dawkins’ only Auckland appearance in 2010. Tickets for the screening are now on sale. The screening will take place in Theatre 098, which is below the Fisher & Paykel Appliances Auditorium where Richard Dawkins will be speaking. People attending the screening will have the opportunity to get their books signed by the author in the Fisher & Paykel Appliances Foyer following the lecture. To book tickets go to: RICHARD DAWKINS LIVE ON SCREEN – iTICKET. Auckland got Richard Dawkins by video this year when he announced the winner of the inaugural Royal Society NZ science Book of the Year award. Next March Wellington will get him in person. 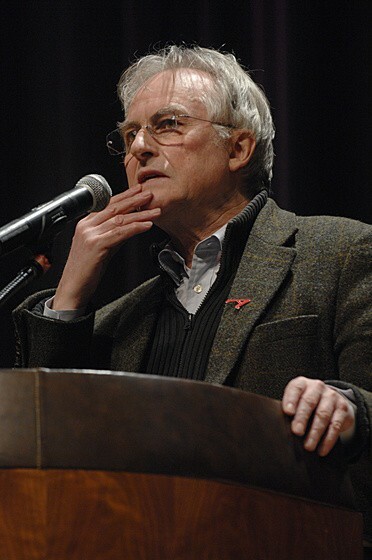 Dawkins will be speaking during the Writers and Readers Week at the NZ International Arts Festival. Details (evening of Wednesday March 10 at the Wellington Town Hall) are at the Arts Festival website. Tickets can also be booked from there.